Picture taken at the NC Zoo last month. The mud pie creation area was most impressive. Last week Pierce came inside and said, "Mom! There's a snake on the front step. I think it is a copperhead. It is brown and has spots on it"
I told him to come inside. A four inch slug on the step. And yes, it did have spots. ze hebben hem dan toch maar mooi gevonden. Gotta luv mud pies and little boys! Time for a trip to the reptile house at the zoo! Mud Pies, I remember making those :) love the pic! laughing at the slug! but so much better for you and your boys! So did you buy one of those pies? Such a cute photo. Glad it wasn't a snake!!!! Ewww to the slug. I am somehow glad you did NOT post it! Knowing you, I bet you just transported it away from the house. 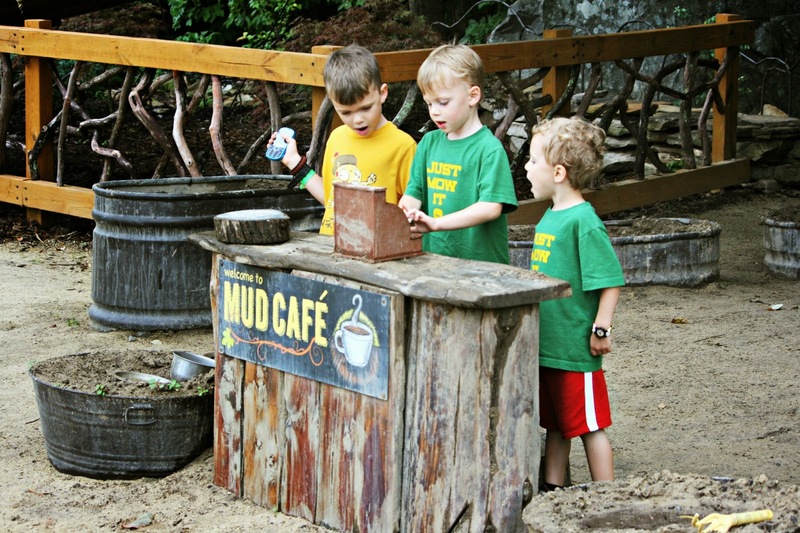 The Mud Pie stand is hilarious, and what a cute picture!! Where is this zoo, I have never heard of it. I thought I had been to all the zoos around here. Is it the Mill Mountain one? Is it a good zoo? Well at least he knows the name of a bad snake. I may prefer looking at a snake as opposed to a 4" slug. Hahaha! Well....that's sorta like a snake! I think I need to set up a mud pie station at my house. Okay maybe not, I don't want to clean up the mess!!! I remember once when Anika was in Elem, I was taking her to school. As we were driving down the road she started screaming and crying. She said there was a snake and it went under her seat. Luckily, I didn't wreck but once I got pulled over it was just a centipede. I could have killed her. She scared me to death. Love the idea of a mud pie station. I bet the kids loved it more. Better safe than sorry with the slug! I've seen those slugs--those spots make it look rather scary. Damn those slugs! Masquerading as poisonous serpents. ! That's so funny about the "Snake". This week Mica told me, "Mom I killed 3 spiders with my Indiana Jones' whip." I told him to clean up the spider guts. I said, "Are you sure you killed 3?" He said, "Yep..Oh wait just 1, the other ones were wood grain on the floor." I LOVE THESE KIDS! SUCH great minds! I enjoyed that description. It made me laugh--an adventure!